To claim this profile, please confirm you are Cali Reno. To follow this profile, please let us know your relationship to Cali Reno. RESULT20th Girls varsity track & field @ "Thomas Jefferson Twilight Meet"
The Bear Creek varsity track & field team placed 20th of 40 at their non-conference meet: "Thomas Jefferson Twilight Meet." The Bear Creek varsity track & field team placed 6th of 9 at their non-conference meet: "Jeffco Qualifer #1." Cali has been added to the Bear Creek girls track & field roster. Cali's basketball stats have been updated for the loss vs. Arapahoe. RESULTLoss Girls varsity basketball vs. Arapahoe. 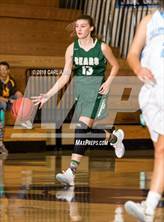 The Bear Creek varsity basketball team lost Tuesday's neutral playoff game against Arapahoe (Centennial, CO) by a score of 73-37. Cali's basketball stats have been updated for the loss @ Lakewood. The Bear Creek varsity basketball team lost Friday's away conference game against rival school Lakewood (CO) by a score of 45-39. Cali's basketball stats have been updated for the loss vs. Columbine. The Bear Creek varsity basketball team lost Thursday's home conference game against Columbine (Littleton, CO) by a score of 49-39. Cali's basketball stats have been updated for the win vs. Pomona. RESULTWin Girls varsity basketball vs. Pomona. The Bear Creek varsity basketball team won Wednesday's home conference game against Pomona (Arvada, CO) by a score of 64-22. Cali's basketball stats have been updated for the loss @ Ralston Valley. RESULTLoss Girls varsity basketball @ Ralston Valley. The Bear Creek varsity basketball team lost Friday's away conference game against Ralston Valley (Arvada, CO) by a score of 64-29. Cali's basketball stats have been updated for the loss @ Valor Christian. RESULTLoss Girls varsity basketball @ Valor Christian. The Bear Creek varsity basketball team lost Saturday's away conference game against Valor Christian (Highlands Ranch, CO) by a score of 52-45. Cali's basketball stats have been updated for the win @ Arvada West. RESULTWin Girls varsity basketball @ Arvada West. The Bear Creek varsity basketball team won Wednesday's away conference game against Arvada West (Arvada, CO) by a score of 45-42. Cali's basketball stats have been updated for the win vs. Wheat Ridge. RESULTWin Girls varsity basketball vs. Wheat Ridge. The Bear Creek varsity basketball team won Monday's home non-conference game against Wheat Ridge (CO) by a score of 56-35.